This volume applies postmodern theory to public relations, providing an alternative lens to public relations theory and practice and developing public relations theory within the context of postmodernism. 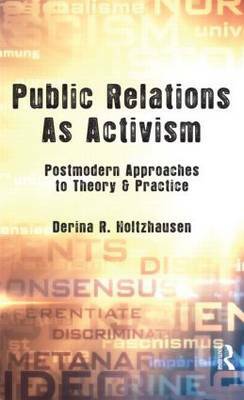 Author Derina R. Holtzhausen focuses on two key issues and their application to public relations theory and practice: the postmodernization of society, and the possibilities postmodern theories offer to explain and understand public relations practice in today's changing society. Holtzhausen's argument is that existing theory should be evaluated from a postmodern perspective to determine its applicability to postmodernity. Utilizing practitioner perspectives throughout the volume, she explores the practice of public relations as a form of activism. The volume is intended for scholars and students in public relations. It may be used as a supplemental text in advanced courses on public relations theory, PR management, organizational communication, and related areas.